Call us at (304) 925-1697 today. For more information or to schedule an appointment with Dr. Ganim Howard, call (304) 925-1697 today! Finding assistance from a Charleston, WV, chiropractor is vital for many to maintain both their personal and professional needs. 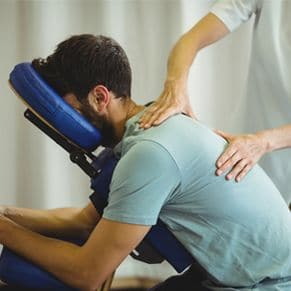 The services provided by Kanawha Valley Family Chiropractic have helped numerous Charleston, WV, residents cope with the injuries they may be experiencing. Our friendly, knowledgeable staff also offers free consultations and payment plans for our patients' financial wellbeing. What results can a back injury have on a life? Those who are suffering from these forms of trauma may not be able to perform their work duties, especially if manual labor is a vital aspect. As long as this damage persists, an employee may not be able to effectively work or perform a full time job. Additionally, if he or she continues physical labor with an injury, the trauma may worsen. In personal lives, being injured can majorly hamper the activities a resident of Charleston can perform. As a result, this can affect both friendships and relationships with family members. In order to prevent further damage, we provide general chiropractic work, massage therapy, and pregnancy chiropractic services at our modern facility. At Kanawha Valley Family Chiropractic, patients are our number one priority. If you are trying to recover from an injury-causing accident or are tired of dealing with chronic physical ailments, contact our team today. Do not let back and neck problems prevent you from enjoying your life in. Find out how our services can help restore your health as quickly as possible. Exclusive Offer New patients receive a Free Consultation. Sign-up using the form or call us at (304) 925-1697 to take advantage of this exclusive offer. Dr. Ganim Howard and his team specialize in techniques of manipulating the spine to reduce pain and prevent common health disorders. KVFC treats a variety of aliments including back & neck pain, headaches, foot pain, and relief from the discomfort associated with pregnancy. We also have special programs for children related to spinal care and injury prevention. ""Dr. Howard is truly a gifted chiropractor. I have been under the care of 3 different chiropractors over the past 20 years & he is the best by far. The staff are very kind & understanding. I look forward to my appointments & the relief they bring. Thanks a million! "" ""In two days I went from not being able to sit or stand for more than 5 minutes without horrible pain, to walking normally again. I greatly appreciate Dr. Howard's skills and highly recommend his services. His staff is wonderful as well.""